The month of October could not have come fast enough for us! We are finally in the home stretch of this crazy idea we got in our heads almost 4 years ago. Closing is set for Oct 28 and there is quite a bit to correct/finish before then. We are hoping that closing is not delayed! 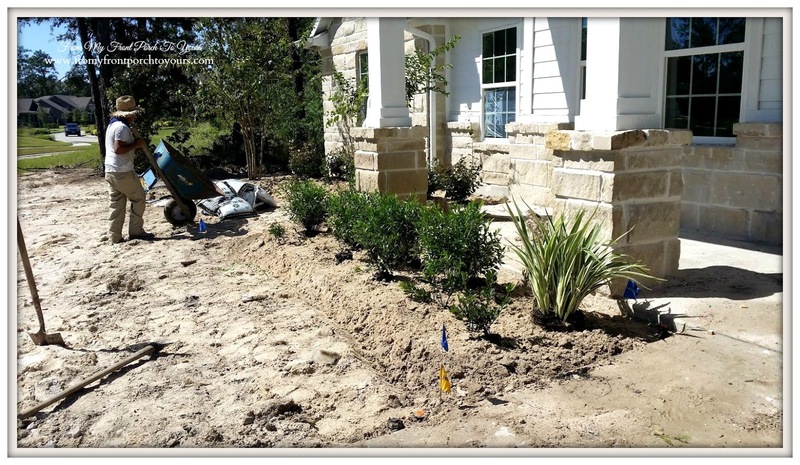 Landscaping was installed. We have Camellias and Hawthorns. I am not sure what the plant is on the right hand side by the sidewalk. Mom or Nana I am sure you probably do? It is green with white lines. It looks very similar to the one we had by the porch at the last house that got the white flowers on it. Once the trees and landscaping went in we started to feel some excitement and relief. Over the weekend sod was put down. We went down a few times over the weekend to water the trees after they were planted because they were not being watered. Thankfully they are starting looking better but it may be too late for our Crape Myrtles to keep their leaves. 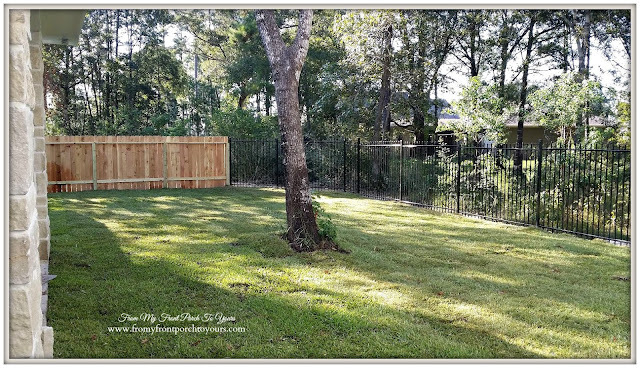 A peek into the back yard. Maybe one day there will be a pool back there in the corner. We will just have to wait and see about that addition. 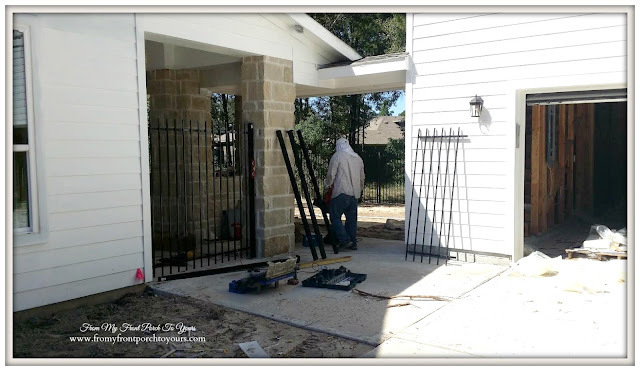 The gate to the backyard was installed. 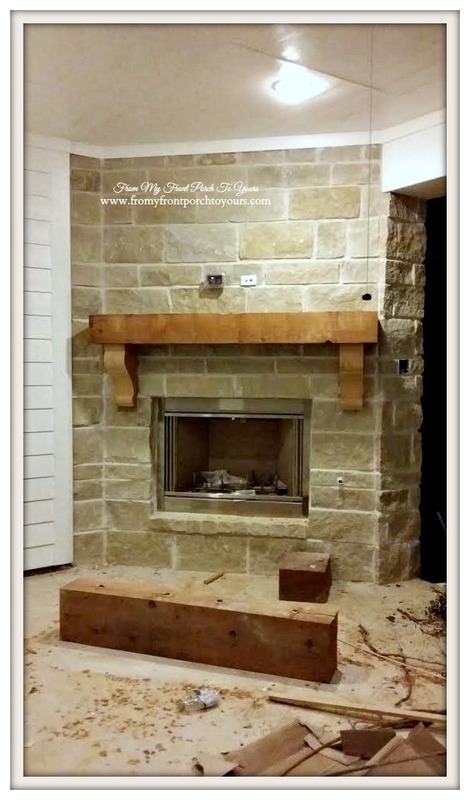 The mantel on the outdoor fireplace was installed and then reinstalled. The first mantel was cut too short. I am truly going to love this space! As I mentioned there is still so much to do in such a small amount of time. 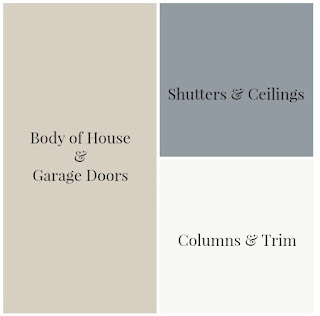 One of those is to paint the exterior of the house. 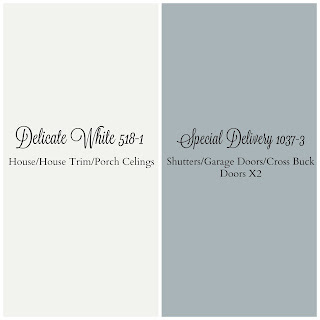 Many of you have voiced that you can not wait to find out the color of our house and that you really love the white. Back at the beginning of the build I shared the paint colors that we chose. We had debated and debated over the colors before hand. 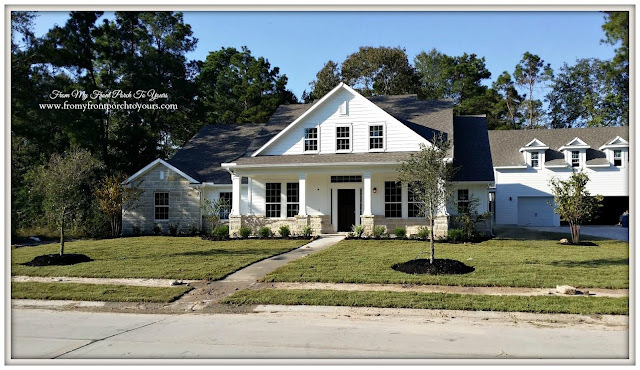 It was a struggle because we had wanted to have a white farmhouse but then we talked ourselves out of white because of the upkeep of a white home. Well the stone was installed and we decided that the color that we chose for the house was not going to work. There was no contrast and the stone was not going to pop. It all blended together. We asked if it was too late to go with our gut instinct on color and were told yes indeed too late. Deflated but accepting we just decided that we could always repaint a few years down the road but then one day an unexpected email came in that asked what colors we wanted for the house. The builder decided to allow us to change our selections! 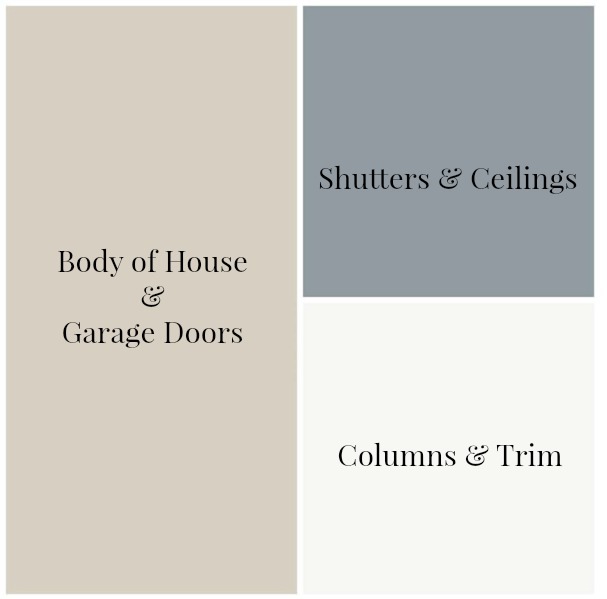 Here are the new colors for our future home. The porch ceilings will eventually be painted in Special Delivery as well but I am wanting to plank them first. Special Delivery is actually lighter than the original blue/gray I had chosen. The decision to go with white was spot on! I can not imagine our house painted any other color. The colors are from Pittsburgh Paints, the paint vendor for our builder. Last night we saw that the garage doors were being painted and I was in LOVE! The coloring is a tad off here since it was dusk when I took this pic with my phone but you can get the idea. Once we move in I am going to paint the outlines of the garage doors white to make them stand out even more and also add carriage house hardware. New lighting arrives today for the garage and front porch. I can NOT wait to close and start installing all of the new lighting. Every farmhouse needs a name and I think we have pretty much decided on one but if you were to choose what would be a good name for our suburban farmhouse? Do you know what the name of the stone is? I love it! It's just gorgeous, Pamela. Love the lighter colors you were able to go with! Your outdoor fireplace looks great! How fun to watch all your choices become realities. Oh it is looking amazing. I can't wait to see it all done and take the tour. Well I was on team white, so I'm happy! Absolutely GORGEOUS! 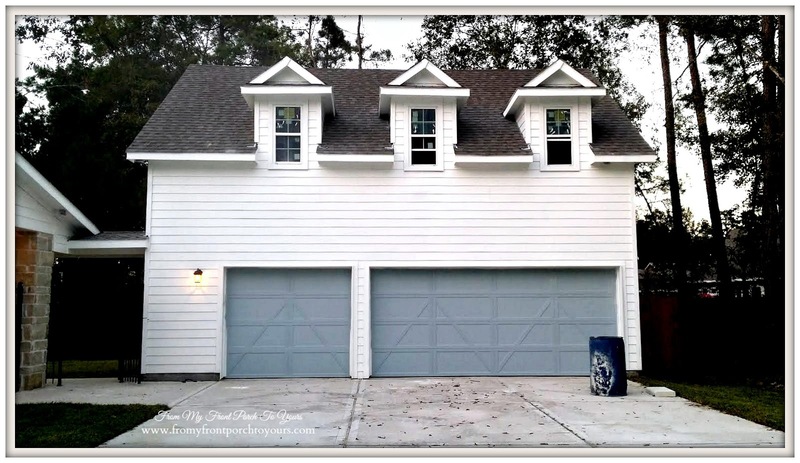 I love your garage doors and the color is AH-MAZ-ING!!!!! You're in the home stretch now! The house is looking great and I am happy that you went with white...best choice my friend. Love that your vision is now a reality. It has your love and soul and individual mark. Yep, you! The color are perfect. The name---you'll feel it. Your house is BEAUTIFUL! I can't wait to see the final (well.... it's never final HA) pictures. 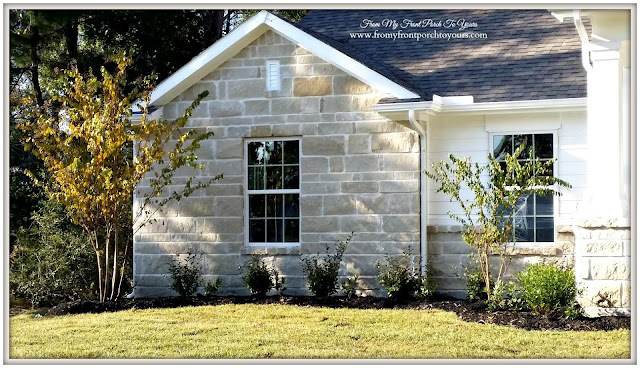 I would like to know what kind of stone you used for the front of your house - it is lovely! So glad the house will be whit and I love that blue. So jealous of the outdoor fireplace! Love this Pamela and so glad you could change the colors. That stone on the house is gorgeous. 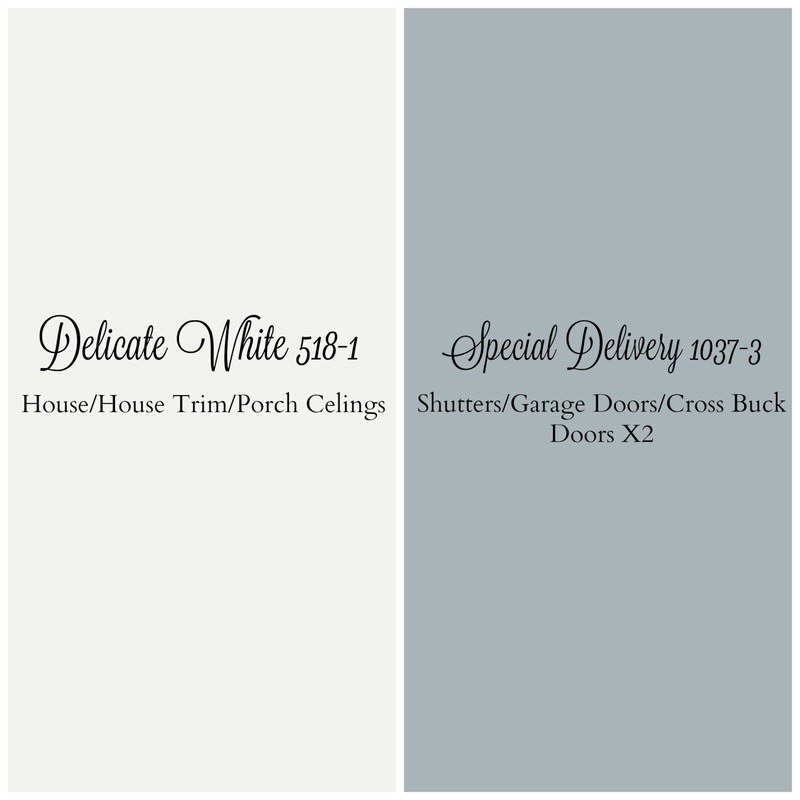 White is going to make the place look more farmhouse to you so I am glad you went with that choice. It is all going to be so beautiful. I excited for you getting closer to moving in. I'm so glad that you got the white. It will look gorgeous with the stone. This has to be so exciting for you. How exciting! What a difference the sod and shrubs make in a yard. Pamela, everything looks amazing. I can't wait to see it all done! How exciting! I love that blue and of course, the white. 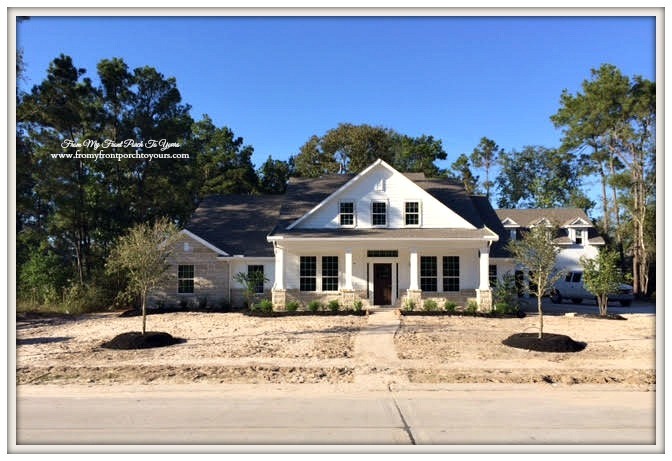 That pic were the sod was put down looks like the home is already done, so pretty!